Marion’s Piazza is proud of our success and our mission is driven daily by our customer. Marion’s Piazza’s years of success just didn’t happen. The tireless guidance of our founder, Marion Glass, built this tradition over 50 years. To Marion, every customer was special. Founder Marion Glass passed away in 2006, but his vision remains the guiding light for Marion Piazza today. From the beginning, Marion lived each day by the standards of giving each customer the best possible product for the best value. And those standards still exist today. On August 19, 1965, after investing his life savings, Marion Glass opened a pizza restaurant at 460 Patterson Road in Dayton Ohio called Marion’s Piazza. When Marion opened his restaurant, it was a first for pizza establishments in Dayton as he offered seating for over 200 customers in his dining room (all other pizza parlors at that time only offered carryout service with no inside dining). Marion selected the name Marion’s Piazza because he liked the idea of an outdoor cafe but realized that this concept would not be successful in Ohio’s climate. Marion therefore, successfully brought the outdoors inside with an Italian piazza, or courtyard, and thus the name Marion’s Piazza was born. 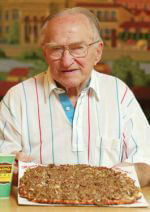 Marion developed a thin crust pizza (now often referred to as “Dayton Style” pizza). By using only the finest ingredients on his pizzas, sandwiches, pastas and salads, Marion’s Piazza soon became a Dayton favorite! To date, Marion’s Piazza has been voted “Dayton’s Best Pizza” in over 37 local newspaper and magazine surveys and has been rated “Second In The Nation of Independent Pizza Establishments” in Pizza Today Magazine. Over the years, Marion’s Piazza has grown to nine locations in the Dayton area. 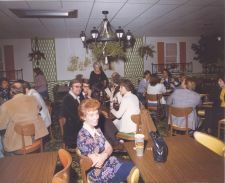 Since dine-in has always been king at Marion’s Piazza (the nine locations seat between 275 to over 500 each), the restaurants have been a gathering place for sports teams, birthday celebrations, reunions, graduation parties and anniversary celebrations. A longstanding relationship with Kenley Players Summer Theater from 1966 through 1995 brought many of Hollywood’s best known stars to Dayton and to Marion’s Piazza; stars like Frankie Avalon, Mickey Rooney, Joel Gray and Sally Field to name a few. Daytonians Rob Lowe and Martin Sheen still frequent Marion’s Piazza when in Dayton. Of the over 250 Hollywood Stars to dine at Marion’s Piazza, Henry Winkler drew the largest crowd in 1975 when over 2,000 people made reservations to see him. Over the years, Marion’s Piazza has shipped thousands of its pizzas throughout the United States to former customers who have moved from the Dayton area. 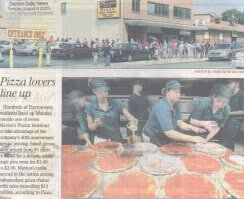 Even actress Pam Dawber, author John Jakes and singer Phyllis McGuire have had pizzas sent to them. Although Marion’s Piazza founder Marion Glass, passed away in 2006 at the age of 92, the business continues to be owned by the Glass family and run by Marion’s son Roger Glass. 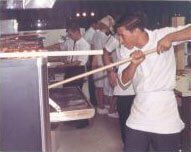 Today, Marion’s Piazza is still serving its award winning pizzas the way it has for the past 50 years!